paper bag & string: Happy World Cat Day 2011!! Happy World Cat Day 2011!! 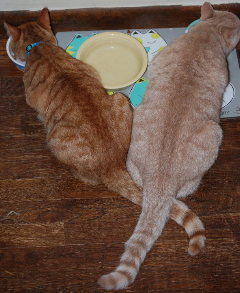 Brotherly love... or hunger... on World Cat Day! Happy World Cat Day to all my feline friends! Ringo (left) and Al are already celebrating! Bring on the nom-noms! Happy World Cat Day!! What a fun photo. What a great picture! Happy World Cat Day to you! That is one great picture! Happy World Cat Day! Cute photo. Worthy of framing. I hope you all had a Happy World Cat Day! HWD to all your paws. Happy belated World Cat Day! What a sweet photo of Ringo and Al!! The way their tails are crossed is so cute!